Come and join some of the New Hardy Players, for a Hardy Welcome. This theatrical experience will take place at Hardy’s house: Max Gate in Dorchester on two evenings in late Octover. Step back in time 90 years in the company of Mr and Mrs Thomas Hardy, an illustrious literary guest, and a few of the colourful characters from Hardy’s novels. 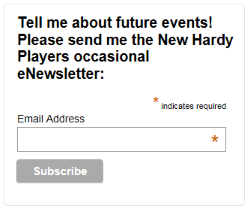 Full details on our Hardy Welcome page.